With its archaic feel and less-than-stellar analysis, anyone who uses Pinterest Analytics knows it’s not necessarily the most useful or visually appealing tool. 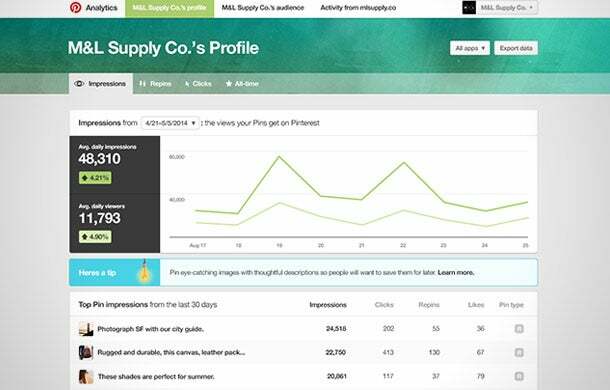 But starting today, the San Francisco-based startup is making its analytics dashboard much more Pinterest-worthy. Also, there are new metrics about the people engaging with your brand and their interests. For instance, businesses can now see what their audience is into – including what other businesses they are following. Plus, Pinterest will offer up advice to companies on how to increase impressions, repins and clicks which can be used to tailor future pins. For example, after Lowe’s learned their “create-your-own-colorful-doormat” Pin received over 200,000 repins, they introduced a DIY-focused marketing strategy. If you haven’t already, get your business account here and start drinking (in a Mason jar, of course) in all that knowledge.